Maintaining good air quality has become a priority around the world, especially in terms of well-being and living comfort. Bad air quality can lead to fatigue, headache and other negative effects. 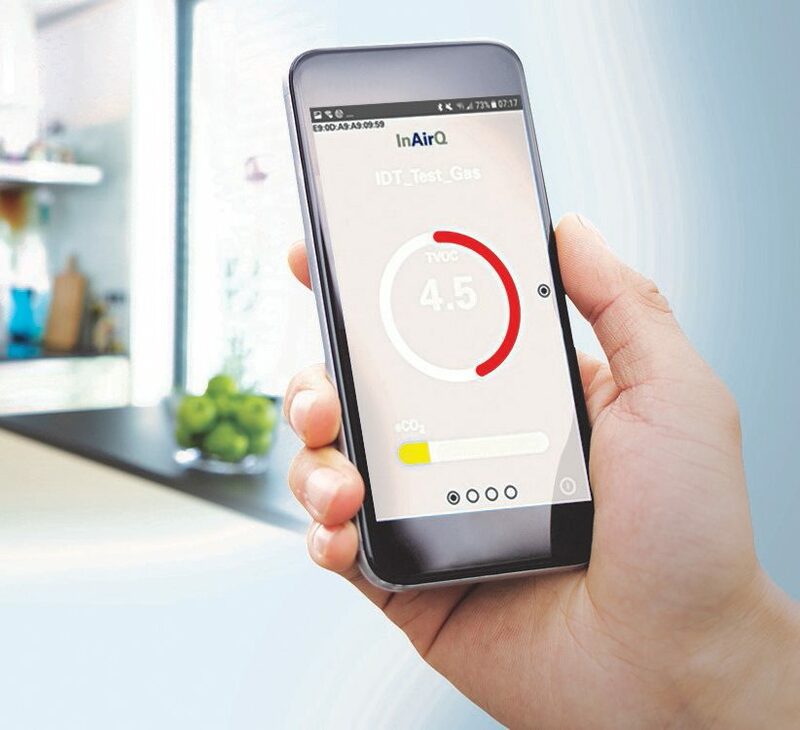 Continuous monitoring of the indoor air quality can reduce these effects and may be used to trigger an action, such as automating HVAC controls, air purification, or simply opening a window. Although there is no universal definition for clean air, it has been shown that organic compounds are an essential source of bad air and can act as an indicator of indoor air quality (IAQ). Because of the constant presence of gases in our everyday lives, it has become more imperative to monitor volatile organic compounds (VOCs) in comfort, environmental safety, automation, health, and medical care applications. Depending on the use case and application, a single VOC or the sum of all organic compounds, referred to as the total VOC (TVOC), may also be monitored. Problems with indoor air quality, such as the so-called sick building syndrome, have significant health and financial impacts on the community. The Environmental Protection Agency (EPA) estimates that poor indoor air quality (IAQ) affects 33-50% of all commercial buildings in the US and is responsible for over 125 million lost school days and 10 million lost work days each year. or pollutant concentrations and lower ventilation rates are associated with a statistically significant reduction in perceived mental performance among students, and that controlling pollutant concentrations improved the measured performance of office workers. Reports also show that a building’s indoor air quality significantly affects the prevalence of respiratory disease, allergy and asthma symptoms, and work performance. The effect of indoor air quality on health is dramatic. It has been reported that the median level of VOCs in office buildings may become several times greater than outdoor levels due to outgassing of building and construction materials. There are several sources of recommendations regarding the TVOC levels that are hazardous to human health. Figure 2 gives a summary for working place threshold safety limits by the German Research Foundation (DFG) and the World Health Organization (WHO) that compares levels from the varying sources for a range of chemicals. All levels are expressed in milligrams per cubic meter (mg/m3) with a usual exposure time of 8 hours, except where a different period is mentioned. Although the concentrations vary from agency to agency, there is a general agreement to keep the TVOC concentrations to a minimum. These values are maximum indoor gas concentrations given for an 8-hour working day and are based on an average 40-hour work week. 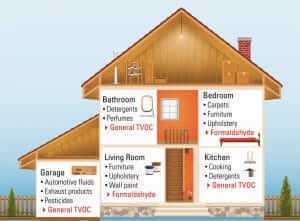 Now, the question remains: What are typical and safe concentration levels for VOCs in a home? Currently there is no global standard that defines IAQ. Some countries have local approaches and have published studies that give indicators of clean ambient air and its implications. These studies suggest that there is a direct link between the TVOC and poor IAQ, although in most cases, health impacts are not considered. This shows the complexity of air quality effects and how much additional research is needed to bring it to a legislative level. The most relevant studies, research results, and certifications include the UBA study by the German Environment Agency (UBA), the Well-Building Standard by the WELL Building Institute (IWBI), the EPA’s Indoor airPLUS, and the Indoor Air Quality Management Group of Hong Kong. Some of these publications also include non-VOC related IAQ parameters, such as room climate, humidity, construction materials, radon, mercury, bacteria, and others, which are only relevant for the particular standard’s mission. However, there is no legal commitment to make use of one of the standards mentioned above. An indoor air quality certification may be issued based on the examination result. Focusing on one specific definition for IAQ, such as UBA, will help the end user evaluate the indoor air hygiene. Dr. Christian Meyer is a Product Marketing Manager at IDT. His past roles in the last 15 years included responsibilities in analyzing different gas technologies, as well as sensor development. His background is in Applied Physics and Engineering for Atmospheric Measurements.